When I went to the pub this evening, I was five consecutive undefeated champion of my table. But today, I was delayed on the road by a stubborn mule, that just did not want to let me on. And so, when I finally arrived at the tavern, my place was occupied by Theodore the Crazy. I thought, I will have to go back home without tonight’s game. There is a rule at the dragon inn, that everyone is sitting in their seats until they fall down. But someone grabbed me by the sleeve and pulled to his desk. A sort of big hulk welcomed me with a grin. Apparently he watched me for few nights and would like to measure his strength with me. However, muscles will not provide you any advantage here. It’s all about technique.. and a little bit of cheating. There are heroes and heroes. Some risk their lives for ordinary citizens, while others just sit around, drink and babble. Today, we will visit those less daring, because we enter Red Dragon Inn together. 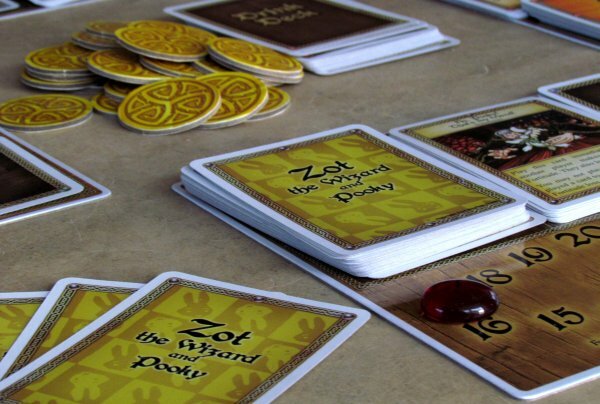 It is name of a board game and also title of one tavern, where whole gameplay takes place. We received already published fifth edition of this creation, behind which stand Geoff Bottone, Colleen Skadl and Cliff Bohm. Illustration were made by Kennon James, Cold Fuzion Studios and Beth Trott. Red box welcomes us with picture of the inn and its inhabitants. You will be able to reincarnate into one of them for length of the match, but you need invocation tools to do this. And they are all here. 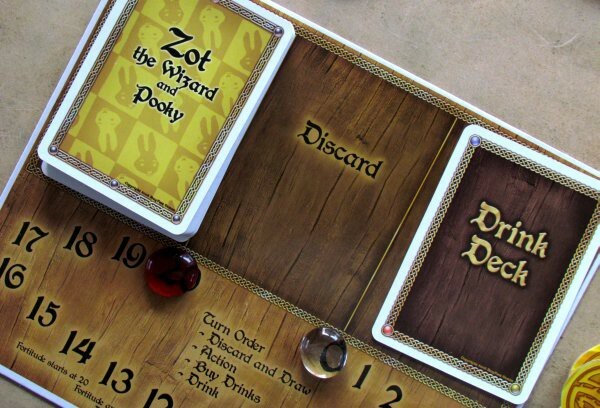 Mainly, its largely composed decks of cards, which comes for each of the four characters and fifth consists of a collection of various drinks, that are waiting to be emptied. 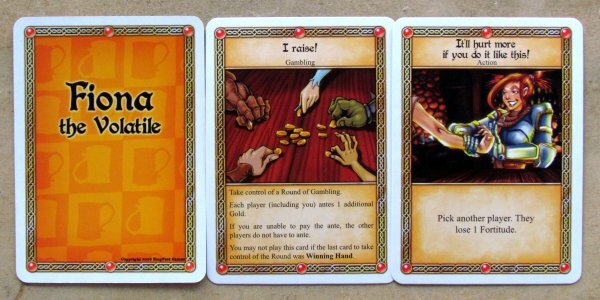 But game also includes glass stones (red bravery and transparent to measure alcohol level), gold cardboard tokens and gambling boards. At the beginning of the game everyone can choose one of four characters, for which will he then be playing. 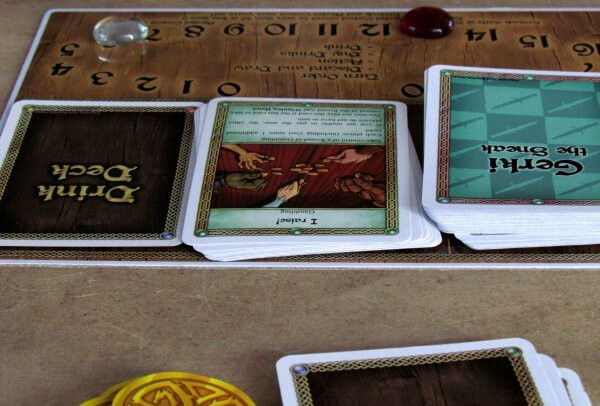 Everybody also takes apropriate deck of cards, which is after shuffling placed at the designated place on the player’s board, which he also got earlier in the setup. 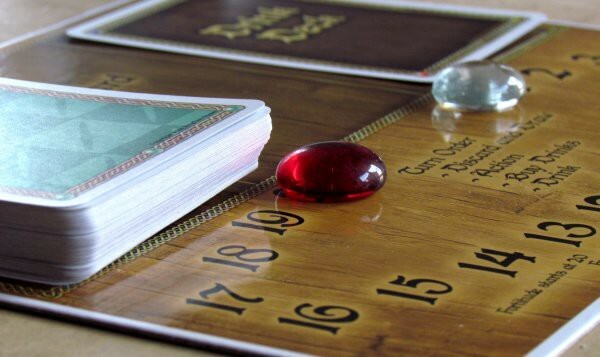 Each player gets seven cards from these shuffled cards. One red stone of courage is then put on number twenty, while transparent stone of drunkenness starts at zero. All heroes start sober. 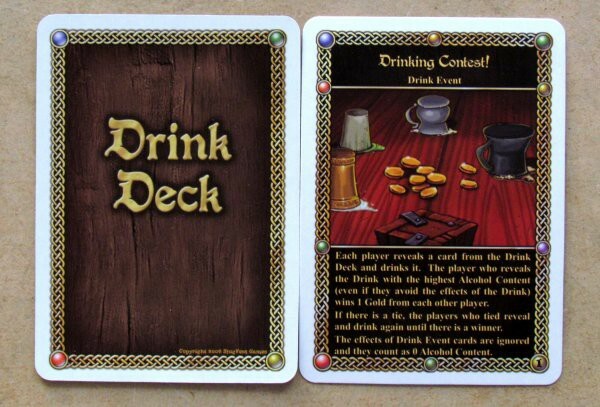 Players will also get one drink card, whose value may he not yet know and forms a basis for his Drink Me pile. Other cards with alcohol will lie in the middle of the table and form a common deck. 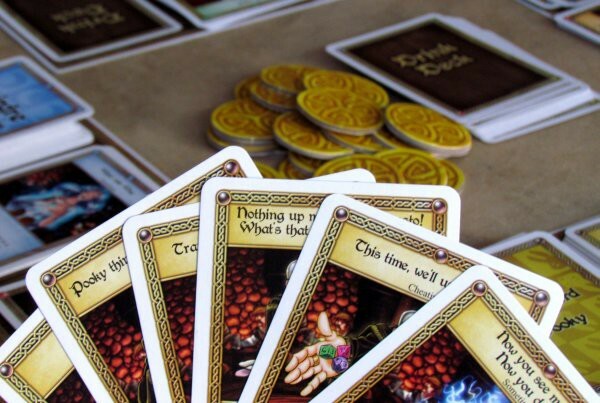 Introduction of each turn is a way to discard some cards, that players do not like and chance to draw a new onees instead, always up to total number of seven. 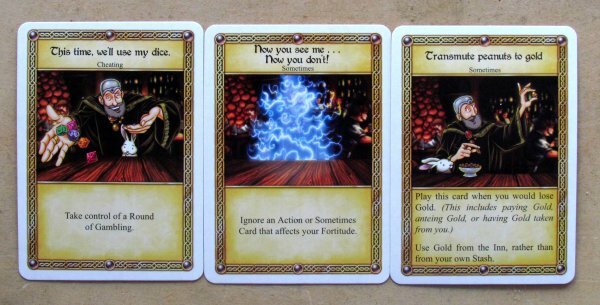 Player can then choose one of them and play it to evaluate its effect. Such cards have word Action written under their name, denoting them as immediately playable cards. Some can be used only in a specific moment or even outside player’s turn. But now, finally, it’s time to drink. 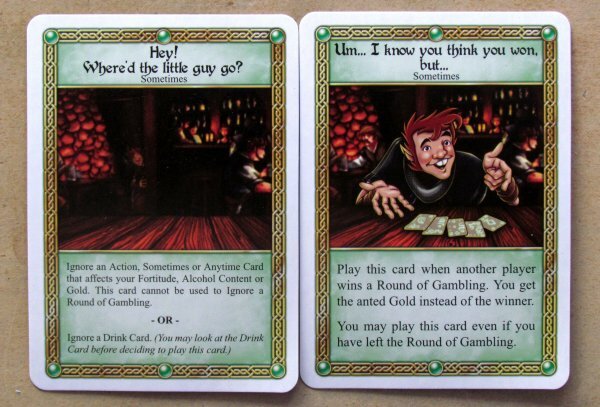 First, player can order a drink to one of his opponents. Without looking, he takes top card from the deck and placed it on Drink me! Deck of one other player. He must then also drink one glass, that lies right before him. He takes top card from his own Drink me! Pile and performs its text, which usually means increasing alcohol level. 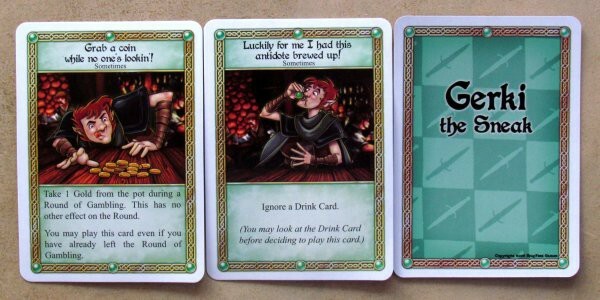 If he has no card to drink, player begins to grow sober. We’d actually be able to slowly end our description, but Red Dragon Inn is not just like any outdoor pub. In addition to the lack of strong drinks, you can also succumb to gambling. At this point, everyone can commit to it, if he has enough gambling cards. Winner of this quick interlude is the one, who is able to play the last gambling, while everyone else passes. Game continues until there is only one player sitting at the table. He is the winner. 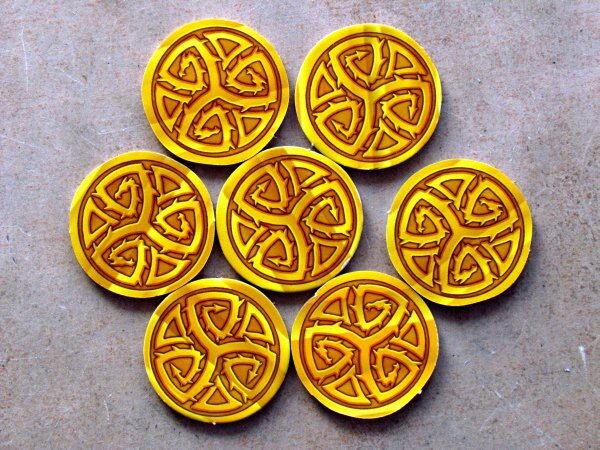 Other can meet one of two unfortunate fates – first one is being thrown out of the pub, because they run out of money. In such a case, a shouldered ork comes over and lets you look through the nearest window. Game ends for this player. Some drinker can become victim to even worse fate, because when their bravery is lower, than level of alcohol in their blood, they immediately faint. Others will split all their money and game continues without them. 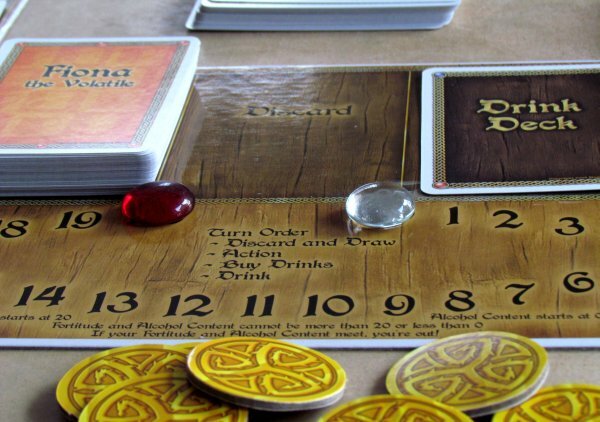 Red Dragon Inn tells the story of heroes and their ability to cope with effects of alcohol. 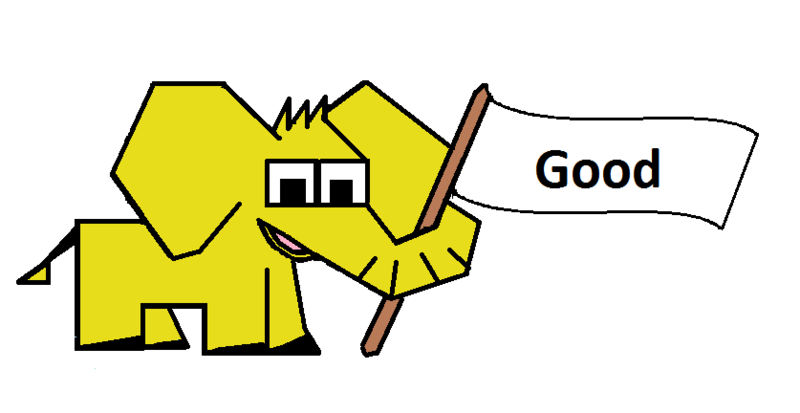 Theme is funny, works well and is not violent. So even abstainers do not mind playing it. We had such players in our group and even with alcohol flavor, they do their best and try, what it’s like to fall under the table, almost unconscious. 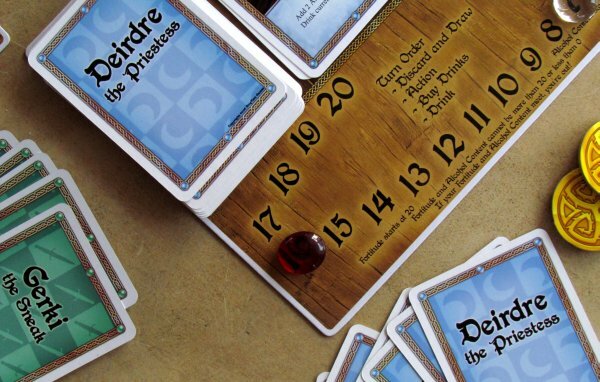 All the players chances of success depend on a random draw of cards from decks. But this time, it not all about win (although, who would not want to be the last sitting at the table), but you must above all have fun. Well, this task is handled by Red Dragon Inn perfectly. Match is full of humorous moments, which are connected to one another. Turns are fast and nobody has too much chance to find one’s feet and he’s on it again. Game is of course full of unexpected changes surprises, but mostly of laughter. It works as a quick and pleasant relaxation for both experienced and less demanding players. A big advantage is very simple rules, that make it accessible to all. There is not only a lot of humor, but above all there is an interlude, where players are in need of cards. And in a tavern on the outskirts of the Kingdom, there is gambling played very very often. You can simply jump in and push your luck. You have to pay in advance and on wood for your drinks in this pub. Therefore, anyone does not mind, if guests simply faint. And winner does not need to be afraid, that he will have to pay for all the others, when they are all gone or unconscious. On the other hand, he can grab their purses and run away! Would you expect anything else in this world? As players try to stay on their feet as long as possible, they must use all the opportunities the game offers. And by this we mean, of course, mostly action cards. 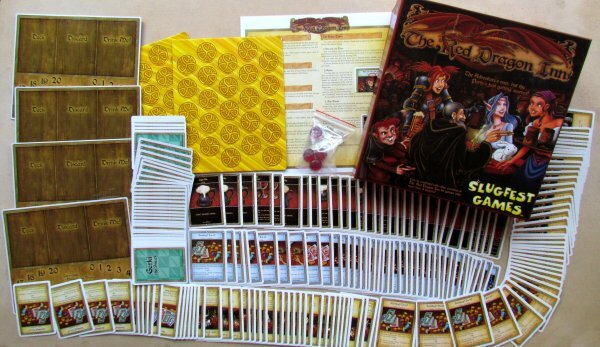 But because each character has a different deck, each game looks a little different. All must use their own strengths to deliver as powerful drinks to other players, as possible. Individual games are fast and last around 45 minutes. But there is no surprise, if we look at the recommended number of players. The more opponents there is, the better. 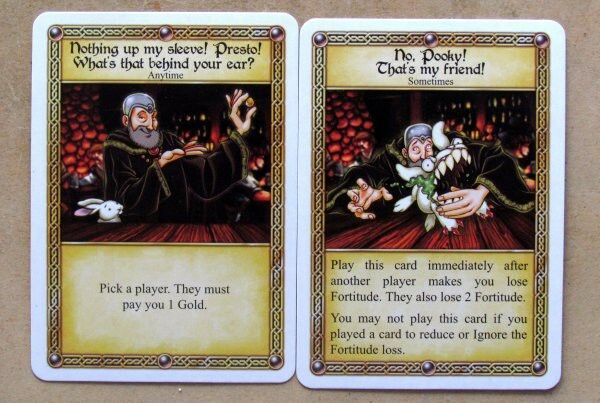 Well, you do not have so big choice, because Red Dragon Inn can be played with just two to four. A with two, game is not quite it. To enjoy the proper fun, you need a full number of opponents. 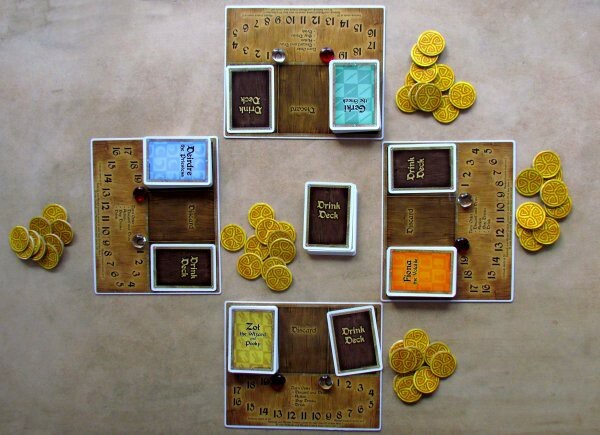 Duel is a little different, but still retains the fun, only in different way. Both players can attack and watch each other and there is no player elimination issue. Processing is nice and simple. Illustration sparkle with wit as well as the entire game. 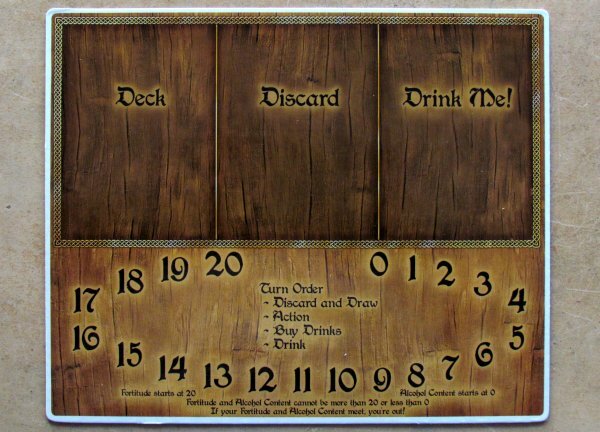 A pleasant enrichment is hidden in game boards, which guarantee, that in any moment in the game, you have a clear view of how other players stands with their level of alcohol. Just a pity, that all four boards are the same. 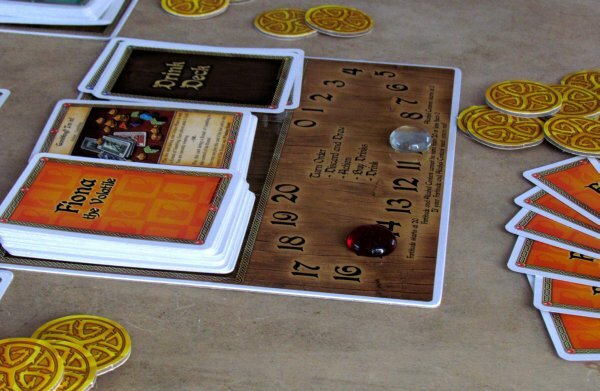 Red Dragon Inn is a cruel and merciless card game. It is full of dirty tricks and unfair practices and player elimination. And as such, it probably will not please everyone. But it will surely find its audience, because there is not enough such true dueling games. And many players like to be mean to others. And Red Dragon Inn works really well to allow this. Red Dragon Inn tells the story of a small pub. All the heroes come here to wash away their sadness. They have great courage, but also a huge thirst, that needs to be extinguished. And when all this ranting starts, you must be careful to not fall under the table or lose all your gold coins. Suddenly, you may find yourself in a stable or even in a nearby creek. 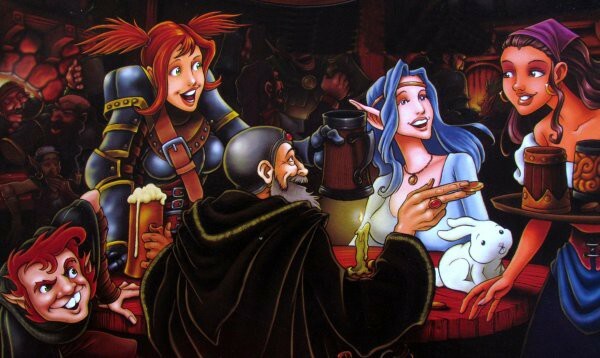 To avoid this, players must use all their skills and try to get others drunk faster. 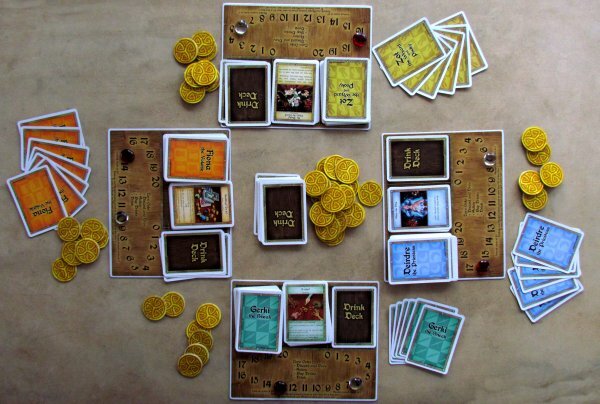 You can also play for money in a quick mini-game, that is fun and full of dirty tricks. But thats indeed true for the entire game, which is fun. It works best in full number of players, but you have to watch out for early player elimination, who then have to wait for their next chance to participate. And luck in the cards? This simply belongs to entertainment cuttthroaty game. And you will get a heavy load of all this. Try to visit Red Dragon Inn for yourself.